Generally, your web browserâ€”while requesting a web page from a websiteâ€”asks for pages in your preferred language(s). Some websites serve their pages in the preferred language of the user. 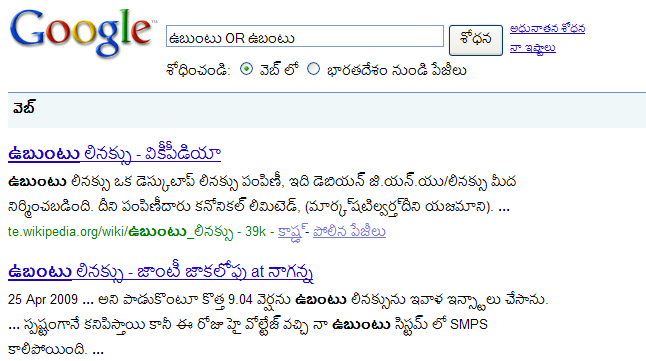 So, if you set your preferred language to Telugu, websites will serve you content in Telugu, if available. Your web browser comes with a default choice of languages. If you download a web browser in your language, this setting might be right. Else, if you use English web browser, you can set â€˜Teluguâ€™ as preferred language in your browser. Apple layout is the second most famous layout on non-Unicode Telugu generation applications. Using the MSKLC, I created Telugu Apple Keyboard Layout for Windows. By using this, you can type in Unicode Telugu wherever you can type in English. Instructions and notes about using Apple Keyboard Layout follows. The number of Telugu blogs has been increasing day by day. Especially, there is a phenomenal growth in the last six months. There seems to be more than a thousand Telugu blogs, with around 250 being regularly updated. The topics covered by Telugu blogs range from comics to cinema, politics to poetry, media to mythology, technology to tradition, education to environment and more. However, not many Telugu people are aware of blogs in their own language. This article is an attempt in spreading Telugu blogs. If you have some good thoughts to share with the world, you can start a Telugu blog. Thinking how to type in Telugu? It’s no longer difficult. Thanks to the recent tools, it is as easy as typing in English. The following is a quick guide that lets you get started blogging in Telugu. 1. How to get yourself a blog? 2. How to Type in Telugu? Commenting on other peoples blogs allows your blog to be get noticed. There are also aggregators for Telugu blogs. Getting listed in these aggregators ensures your Telugu blog will reach to fellow bloggers and many more people. You just need to send an e-mail to the maintainers of the aggregators that you have started a Telugu blog. Regularly visiting one of these aggregators keeps you abreast of what is going on in Telugu blogosphere and brings to your notice good blog posts that you would otherwise have missed. Telugu bloggers are an active community. You can join them at TeluguBlog Google Group for discussions on technical and general problems in writing blogs in Telugu. Update (2007-07-15): Added Jalleda.com to Telugu blog aggregators and blaagu.com to the sites where you can start a Telugu blog.